It’s back to business for Charlie Chap who will attempt to win the Mollymook Cup first-up at Nowra on Sunday. Charlie Chap hasn’t raced since June with trainer Mike Van Gestel confident the gelding will run well after a lengthy break. 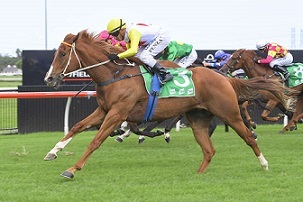 “He pulled up with cardiac arrhythmia after his last start so he had a break and is ready to race again,” Van Gestel said. “He has drawn the outside barrier which is alright for him. He doesn’t show a lot of early speed, but finishes off well when he can get to the outside. Charlie Chap is a family favourite – being purchased as a foal by members of the Van Gestel family and friends. Charlie Chap brings a solid first-up record into Sunday's Mollymook Cup at Nowra. (Pic: Bradley Photos). He has won three times, but importantly two of those wins have been when he is first-up. Charlie Chap, who won at Kembla Grange in March, hasn’t raced since June and has had a couple of setbacks this campaign which have kept him out of racing until now. “He has had a few minor things go wrong, but over the last month he has come right and I’m happy with him,” Van Gestel said. Van Gestel doesn’t travel often from his Hawkesbury base to Nowra, but if he has the right horse and can find a suitable race he doesn’t mind the lengthy trip. “It’s a bit over three hours for me, but I have had a bit of luck at Nowra with the horses I have raced there,” he said. The 74-year-old won with Cheeky Bella at Nowra in April and admits you need the right horse to win to make the trip worthwhile. “It’s a fair way to go so you want to be fairly confident,” he said. Trainer Graeme Murray will have three starters in the feature race headed by Coolotta with a massive weight of 62.5 kilograms. He will also saddle up Sacred Son and Fantasy Belle in what will be the 40th running of the Mollymook Cup. His late father Bede dominated the race for many years and Murray would love nothing better than to win one in his own right. “It’s been a great race for the family and I hope we can win it again,” he said.